The legendary composer and Deep Purple co-founder, Jon Lord, rocked Bulgaria's second largest city of Plovdiv Tuesday night. The two-hour, unique concert marked the official opening of Plovdiv's Fall Arts Salon. All seats as well as the steps and the grass area of the splendid Plovdiv Antique Rome Theater were filled to the top with fans, who came from all over Bulgaria to hear the legendary Deep Purple keyboardist and composer. The concert was a joint production of Jon Lord and the two vocals traveling with him - Doogie White and Polish-born Kasia Laska, three of the musicians from the Bulgarian band TE - Ivaylo Zvezdomirov, Venko Poromanski and Darin Vasilev, and the Plovdiv Philharmonic Orchestra, directed by Naiden Todorov. The concert included two parts - one with classic music and solo projects of Jon Lord and one with cover versions of Deep Purple's hit songs. Each piece received standing ovations by the enthusiastic and ecstatic audience. The spectators had the unique opportunity to hear a live performance of one of Lord's finest works, his composition Concerto for Group and Orchestra, which was first performed at the Royal Albert Hall in 1969 with Deep Purple (Lord and Ian Paice with guitarist Ritchie Blackmore, singer Ian Gillan and bassist Roger Glover) and the Royal Philharmonic Orchestra. The concerto was revived for its 30th anniversary in 1999 with another performance at the Albert Hall, again performed by Deep Purple (Lord, Paice, Gillan, Glover and Steve Morse in place of Ritchie Blackmore) with the London Philharmonic Orchestra. 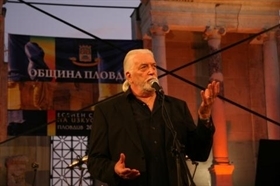 Jon Lord, himself, gave high marks to the city of Plovdiv, its mayor, its people and the Tuesday night audience. He expressed his admiration for the Plovdiv Philharmonic Orchestra, the talent and the hard work of the musicians and advised the music fans to pay more attention to them and local performers, support them and attend their concerts. Jon Douglas Lord, who was born in England on 9 June, 1941, is a famous composer, Hammond organ and piano player. He is recognized for his Hammond organ blues-rock sound and for his pioneering work in fusing rock and classical or baroque forms. He has most famously been a member of Deep Purple, as well as of Whitesnake, Paice, Ashton & Lord, The Artwoods and Flower Pot Men. In 1968, Lord co-founded Deep Purple. He and drummer Ian Paice were the only constant band members during the band's existence from 1968 to 1976 and from when they reformed in 1984 until Lord's retirement in 2002.